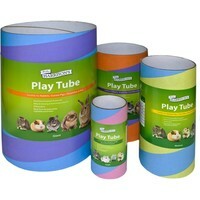 WH Play Tube For Small Animals is a fun accessory for your small animal. Made from biodegradable vegetable parchment, these fun play tubes help encourage natural chewing, burrowing instincts, stimulation and exercise. Small animals such as rabbits, guinea pigs and hamsters are intelligent, inquisitive and social animals by nature and need to be kept occupied and receive mental stimulation. Without stimulation your pet may become depressed, destructive and generally bored. Walter Harrison's play tubes are ideal to add to your pet's cage, hutch or run to help keep them entertained and prevent symptoms of depression or boredom.